Throughout American history, cities have been a powerful source of inspiration and energy, nourishing the spirit of invention and the world of intellect, and fueling movements for innovation and reform. In The Unfinished City, nationally renowned urban scholar Thomas Bender plumbs the source of the city’s power over American life. 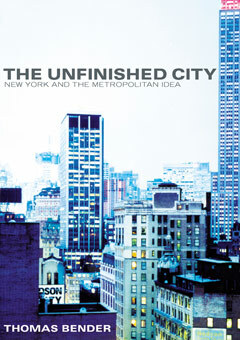 The Unfinished City traces the history of New York from its humble regional beginnings to its glittering present status on the global map. In Bender’s account, the city took shape not only according to the grand designs of urban planners and business tycoons, but also in response to a welter of artistic visions, intellectual projects, and everyday demands of the millions of people who made the city home. Bender’s story of urban development ranges far and wide, from the streets of Times Square to the workshops of Thomas Edison, the paintings of Georgia O’Keeffe, the construction of the Brooklyn Bridge, and the photographs of Berenice Abbot. In a tour that spans neighborhoods and centuries, The Unfinished City makes a powerful case for the enduring importance of cities in American life. For anyone who loves New York, and for those who are interested in the rich possibilities for all cities, this book is an unparalleled guide to the city's past and present.